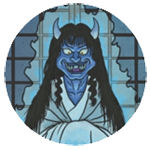 APPEARANCE: Shīsā are small, lion-like yokai which are found throughout Okinawa, in close proximity to humans. While they are very similar to Japanese komainu, there are a few notable differences. Shīsā are native to Okinawa, and are thus only found on the Ryukyu archipelago and the southernmost islands of Japan. Shīsā are smaller and more dog-like than their Japanese (medium sized dog-lion hybrids) and Chinese (large and very lion-like) cousins. INTERACTIONS: Lion-dogs are commonly depicted in East Asian sculpture as guardian deities. 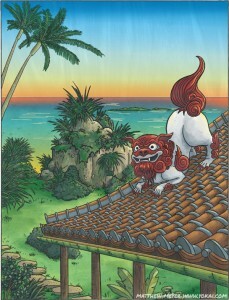 Komainu and shishi are nearly always found in pairs, yet it is common to find solitary shīsā perched on the roofs of houses that they guard. Chinese shishi are usually used as imperial guardians, Japanese komainu are usually used as shrine guardians, and Ryukyuan shīsā are usually used as house or village guardians, perched on rooftops, village gates, castles, or gravesites. Shīsā are also depicted as shrine guardians, with male/female pairs representing the “a” and “un” sounds. This behavior was likely imported from Japan after the Ryukyu islands were conquered. However there is disagreement over the genders. In most depictions, the right, open-mouthed shīsā is the male, beckoning good luck and fortune, while the left, close-mouthed shīsā is the female, protecting the village from natural disasters and evil spirits. In other depictions, the open-mouthed shīsā is the female and the closed-mouthed shīsā is the male. ORIGIN: Shīsā are very close relatives to komainu, and share the same ancestor: China’s imperial guardian lions. However, while komainu arrived in mainland Japan via Korea, shīsā were imported to the Ryukyu islands directly from China, before Okinawa was part of Japan. In fact, the name shīsā is actually the Ryukyuan pronunciation of their Chinese name, shishi, which is also sometimes used for komainu in Japanese.